In addition to our activities, the club's members come together each spring for the Annual DVFF Auction, which raises funds for various conservation organizations supported by our club. This auction offers great deals on gear and the money goes to good causes. As the name implies, we are a club dedicated to helping you become a better fly fisherman. That includes outings, classes, instruction and conservation. 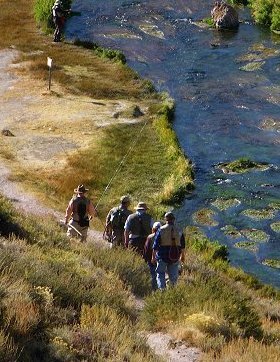 For nearly 50 years the DVFF has been one of Northern California's largest fly fishing clubs, and one of the largest in the nation, dedicated to fly fishing enthusiasts and to the introduction of newcomers to this pastime. Fly fishermen of all levels of experience and dedication can find a home in the DVFF. The club offers a range of opportunities and activities. As a DVFF member, if you want to learn to fly fish, our one-day Novice Fly Fishing Seminar and a follow-on Novice Outing can teach you the basics ranging from techniques, equipment, casting, knots and basic entomology. As a member of the DVFF, you also can to learn to build a fly rod. If you want to try your hand at fly tying or try to improve your fly tying skills, we regularly offer classes for both beginners and experienced fly tiers. On the third Tuesday of every month, our club meetings offer programs led by notable experts or knowledgeable club members. Throughout the year you can join club members on outings to a variety of destinations, near and far. And there's never a shortage of fishing stories. In addition to our activities, the club's members come together each spring for the Annual DVFF Auction, which raises funds for various conservation organizations supported by our club. This auction offers great deals on gear and the money goes to good causes. Conservation organizations supported by the DVFF funds include the California Sport Fishing Protection Alliance, Cal Trout, Project Healing Waters, and The Fall River Conservancy. The club hosts other events throughout the year, included a Crab Feed/Officer Installation Dinner and a family barbecue. We think we have a lot to offer. Feel free to stop by a meeting to see and hear what we're all about. Thanks you for your interest and we look forward to seeing at a meeting! All members must agree to a release of liability (by checking the appropriate box during the application or renewal process) to participate in any activities.